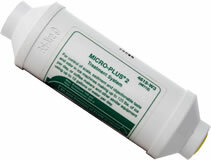 This Micro-Plus 2 system is rated 12½ gallons per day. Designed and manufactured to eliminate and control the three primary water-related problems: lime scale, silt and sediment, and objectionable tastes and odors. The Micro-Plus accomplishes this through 4 stages. Micro-Plus contains 6R Micromet®, an NSF Listed, food-grade slowly soluble polyphosphate, which dissolves slowly into the water and stabilizes the hardness minerals, thereby preventing scale formation. Micro-Plus is equipped with a 100 micron screen to pre-filter the water as it enters the device and a 20 micron filter disc to filter the water as it leaves the device. This graduation of micron filtration, from 100 micron to 20 micron, enhances the service life in waters containing a high level of suspended particles, yet still provides 20 micron water. Micro-Plus contains the best available activated carbon for absorbing these contaminants. Removes objectionable tastes and odors providing high quality water to breathe. The Micro-Plus 2 housing is constructed of NSF approved PVC. The ends are tapped 1/4" FPT, Length 6.25", Diameter 2.09. Maximum temperature 100°F. Corrosion has been major problem with steam humidifiers which are related to water supply chlorine and minerals. The NuCalgon 4296-60 primarily used for keep condensate pan drain lines clear can also be used to treat humidifier. Pan-Treat tablets can be used to condition humidifier water in order to prevent odors and deposit build-up. Pan-Treat is formulated with ingredients proven effective in cleaning and preventing these deposits, and its use will eliminate the extra maintenance costs associated with odors, mineral build up, plugged drains and overflows. Easy to use and safe, water soluble, non-corrosive, non-toxic and biodegradable. Use 2-4 tablets every four to six weeks as needed. Clean and rinse out the humidifier's reservoir on a regular basis.